Oscar and May Tupper, Darlene and Donald moved to the Sandhills in the spring of 1920. The farm was located in eastern McPherson County, and was known as the “Old Canning Place”. The home in which they lived was a sod house. The home was very comfortable for the family of six, after two more children, Maxine and Dorothy, were born in this sod house. About 1926 several frame rooms were added to the house and the sod walls were covered with cement to preserve them. A well was dug by Alva Main on a nearby hill providing a pressure water system for the farm. Bud Smith engineered digging the cistern, laying the pipes and installing the bathroom fixtures. After more than a half a century this well is still in use. The original sod barn was replaced by a large frame barn. Oscar was killed in a farm accident in 1927. May continued living in the “soddy” with the four children. In 1932 she married George Dickson and this continued to be their home until May passed away in 1976 and George in 1977. The original house, which was built in 1902, was constructed of virgin sod, grass that had never felt the plow. The usual procedure was to use a sixteen inch breaking plow to turn over strips of sod about four inches deep, twelve to sixteen inches wide and about three feet long. The thick buffalo grass had long tough roots which held it together. The sod slices were used like bricks – laid over-lapping one another, grass side down, making the wall self-supporting. The grass was cut uniformly to keep it even and fill the cracks. These “bricks” were laid up around a wooden door frame. After the walls were about two feet high the desired window frames were added. Boards were laid across the bottoms and tops of the windows. This sod house had a frame and shingled roof, although many had a sod roof. The inside walls were plastered, then either painted or papered. The wide windows and door frames are trademarks of a sod house. The deep windows made an excellent place for houseplants. 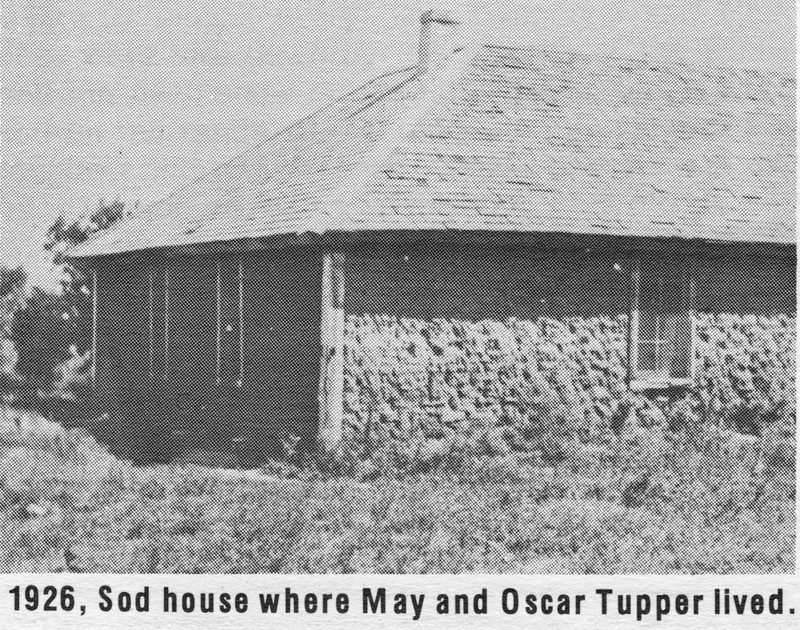 With the coming of electricity to McPherson County the sod house had all the modern conveniences of any home. The sod house had its advantages of being warm in winter and cool in the summer. Darlene Tupper Waits passed away in 1967. Maxine Tupper Mote lives at Orchard, Nebraska. 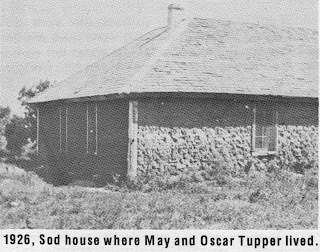 These are some of the memories of this sod house which still stands and is on the ranch owned by the son, Donald Tupper, of North Platte, Nebraska.